Whether you're looking for a simple gift to show a visitor or host your appreciation or need a basket stocked with snacks to please every appetite at your own gathering, these hosts' favorites are sure to make an impression. 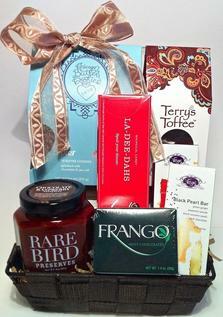 This gang of gifts is one no one will mind you hanging out with. Speaking Ill of the Dead: Jerks in Chicago History ​is a delightfully wicked look at 25 badly behaved characters who shaped the colorful history of the Windy City. 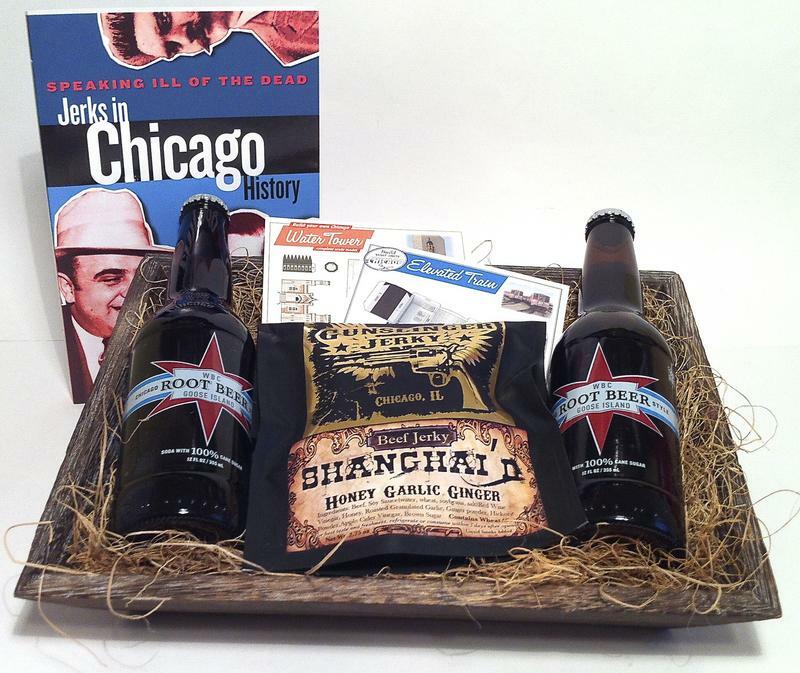 Since every good crook book needs some quality cohorts, we've matched the book with 2 Build Your Own Chicago postcards, a package of Gunslinger Jerky's artisanal all-natural, hand-cut beef jerky and two 16 ounce bottles of root beer from Chicago's Goose Island Brewery. Don't be a jerk, share one with someone. Explore one of the world's great food cities with this book that's so much more than a cookbook. Chicago Chef's Table is an intimate guide to the city's food traditions and influences both old and new. In it, the best chefs in the city share "at home" recipes from over 50 legendary dining spots. This quartet will stylishly set the stage for wine and cheese. The 14" x 6" x 1" Neighborwood bread or cheese board is beautifully crafted from fallen urban growth timber from neighborhoods in and around Chicago. Since the boards are hand made, no two are alike. We've included some local treats perfect for pairing with cheese: Chicago Flats seasoned flatbread crackers, savory seasoned nuts from Mama's Nuts and one of Rare Bird Preserves' unique local and sustainably grown fruit preserve flavors. To help you start testing these recipes at home, we've included Seoul Sauce from featured restaurant Urban Belly and two signature Chicago spice blends from trusted local spice purveyor, The Spice House. ​This crowd favorite will satisfy your gathering's cravings with the perfect mix of sweet and salty treats, all made locally. Snacks include: Gary Poppins+Cheddar+Kettle Mix Popcorn, Nicole's Crackin' Good Cheese Crackers, Mama's Nuts fresh seasoned nuts, Chicago Flats seasoned flatbread crackers, a Vosges Haut Chocolat bar, Chicago Butter Cookies, a Hilary's Cookie, Terry's Toffee, and addicting Pretzel Grahams from Salted Caramel. 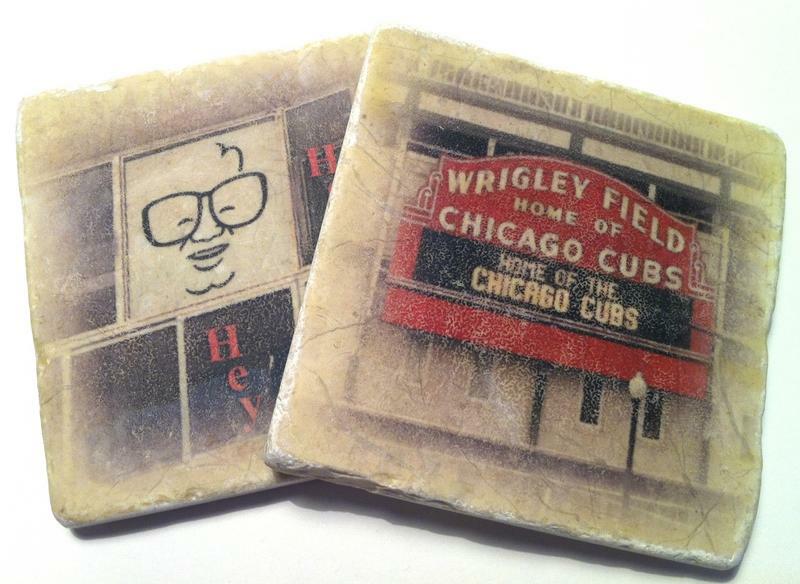 Local photographer Denise Riesen captures some of Chicago's most iconic landmarks and transfers the images onto tumbled marble tiles to create a perfect resting spot for cold or hot beverages. Each 4" x 4" coaster is backed with cork to protect surfaces. 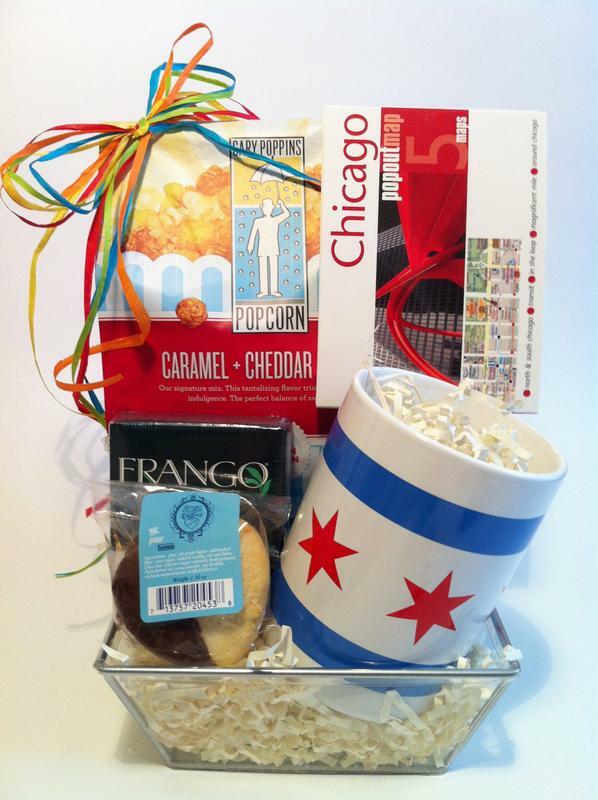 Even locals and repeat Chicago visitors will appreciate this combination of local foods, a convenient pocket-sized "pop-out" map and our generous 15-ounce ceramic mug that's emblazoned with Chicago's beloved city flag. Gary Poppins Caramel+Cheddar+Kettle Mix Popcorn, classic Frango Mint Chocolates and a two-sie pack of melt-in-your-mouth Chicago Butter Cookies. Chicago’s candy capital status continues today and chocolate reigns supreme in this collection -- from classic Frango Mint Chocolates that summon memories on State Street to a court of more recent Chicago confection legends including chocolate-dipped Chicago Butter Cookies, Rare Bird's Chocolate Raspberry Preserves and Topping, La-Dee-Dahs from Whimsical Candy Company, Vosges Haut Chocolate mini bars, and Terry's Toffee. 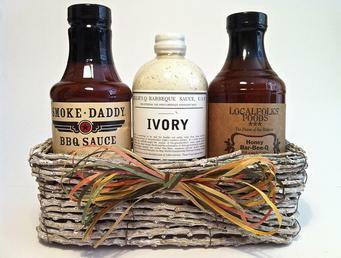 We've corralled three of our favorite local barbecue sauces for this tasty gift. Each 16 ounce jar offers a distinctive flavor for ribs, burgers, chicken and more. and Honey Bar-Bee-Q Sauce from Local Folks' Foods.